Will the man never stop? At barely 35 years of age, George Calombaris (aka Georgie) has already has a string of successful restaurants under his belt, not to mention being the adorable co-host of Masterchef. Eager to expand his empire, he’s now turning his hand to cheap and homely Greek food, serving up souvlakis, salads, and other nibbles at his newest restaurant, Jimmy Grants. 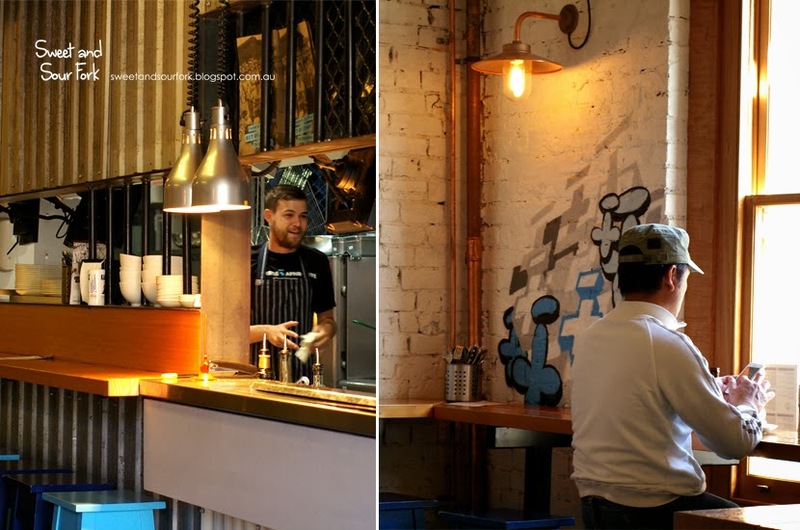 It may be on a small side-street, it may have no signage except a neon blue ‘plus minus’ sign, and it may look like an abandoned warehouse, but word of good food travels fast and far in Melbourne. The funky stop-over started filling up rapidly after 5:30pm; it’s popular with the young and hip, as well as the older folks with prams in tow. The funky music kept Chris grooving throughout the entire meal. Normally we’d have a souva (Georgie’s words, not mine) each, but on account of all the delectable sides on offer, we decided to just share The Bonegilla ($8.5) in order to leave room for other goodies. This was just like any other good souvlaki you’d find, but subtly refined. The bread is pillowy soft, the mixture of spit roast chicken and lamb succulent and extremely flavoursome, and the pungent garlic sauce was replaced with a tangy mustard mayo. It was the gourmet souvlaki experience with neither the pomp nor the guilt. It’s not always a good thing when the main dish is overshadowed by the sides, but in this instance it’s a case of good and great. As delicious as the souvlaki was, I couldn’t keep my grabby hands away from the Chips, Garlic Oil, Feta, Oregano ($6). It’s just a regular (albeit golden, crisp and fluffy) plate of chips, but top it off with a scattering of feta and oregano, and the result is pure magic. Chips are great, but chips interspersed with creamy hunks of herbed feta are even better. We had both wanted to try the ‘Jimmy Dimmy’ (it’s what it sounds like), but I put my foot down and ordered us a Village Salad ($7) instead. Like everything so far, it’s simple but done just right. The combination of crunchy cucumber chunks and chewy pearl barley brought some much-needed freshness to the meal, its flavour augmented with a handful of mint and coriander, and generous amounts of olive oil. Because we just had a salad, we were now allowed to have dessert, so we finished our meal with the Jimmy’s Wheel ($6). It was essentially a larger and fancier version of the wagon wheel, with chocolate biscuits sandwiching strawberry marshmallow, all coated in milk chocolate. The surprise came when we got to the middle, and found a center of peanut butter and jam, transforming this classic biscuit into a sweet and salty playground. We couldn’t have been happier with our meal at Jimmy Grants. Not only is the food fresh, flavoursome, and almost-healthy, it is also ridiculously affordable, especially given the quality of it. We need more places like this around Melbourne. Rating: 15/20 – jimmy grants wishes. This rating reflects my personal experience at the time of visit. There are no comments available for this post (yet). Copyright 2015 Sweet and Sour Fork. WordPress Theme by Chris Lewis.